This Year’s Eurovision conference, which will take place in Copenhagen during Eurovision week 2014, will as its main theme focus on the multiple visions of Europe in the Eurovision Song Contest. Such visions can take many shapes, be they politically, economically, culturally, sexually and (mental) geographically charged. Visions of Europe link intrinsically to specific comprehensions of Europe in past and present. Visions are always partial, situated, embodied; they have material-discursive implications. Popular culture and performance cultures represented in the Eurovision Song Contest offer distinct opportunities for observing and displaying the contested nature of envisioning Europe. The conference is now open for enrolment. The conference fee is DKK 1200 including lunch, coffee, etc. all days. The conference dinner takes place Tuesday 6th May and costs additionally DKK 450. For registration and payment see here. Copenhagen is not a cheap city when it comes to hotels, but bargains can still be found. We recommend to book as soon as you can due to the many visitors coming for the Eurovisions Song Contest. Please find more information here. 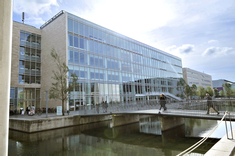 The Conference wil take place at the Faculty of Humanities, Karen Blixens Vej 4, 2300, Copenhagen S, Auditorium 22.0.11. Get more information here.